Rational Expressions: How does feedback help? Feedback is supposed to help students learn stuff. How? By what mechanism? Why would ever feedback help? A lot of my confusion about feedback has been about my inability to clearly answer this question. After reading a few articles and chatting with some teachers, I think that I know of two ways in which feedback helps. Mechanism #1: You can impact what someone is thinking about. One way that your response to someone can help them learn is by redirecting their thinking. Every comment we make to someone else has the capacity to literally change what they are paying attention to. Paying attention to something can lead someone to learn something new. I saw an especially clear articulation of this idea in "Feedback Interventions: Toward the Understanding of a Double-Edged Sword." 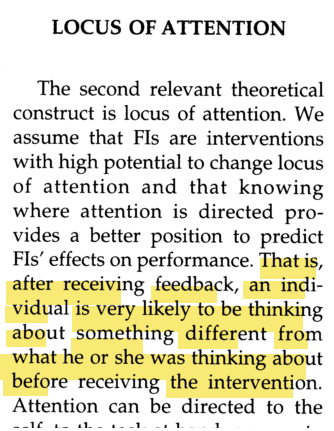 "After receiving feedback, an individual is very likely to be thinking about something different from what he or she was thinking about before receiving the intervention." I think that asking questions in response to student thinking is a great example of trying to impact learning via redirecting someone's attention. Mechanism #2: You can motivate a person to go after a good goal. It's certainly true that sometimes, when you find your performance deficient in some way, you're motivated to improve yourself. I discover that my joke didn't make anybody laugh, so I'm motivated to try and tell a funnier joke. In the process, I learn more about how to make someone laugh. Bada-bing. It's also certainly true that sometimes this doesn't work so well. You tell somebody that you didn't find their joke funny, and they get offended or decide that they don't want to share their jokes with you anymore. You're a humorless grump. You're a critic. Or they decide that they're not funny, so they stop trying to be funny and learn nothing more about humor. This second way that feedback can help learning is all about motivation. But when does feedback help motivation and when does it hurt? How do you give feedback so that it helps? This is something that has to do with grades vs. comments, mindset, experts vs. novices, and feedback on skills vs. feedback on the task. I've been a heavy user of redirecting thoughts in my responses to students over the past few years. I spent less and less time comparing my students' work to learning goals because I knew of the dangers of trying to motivate them but not how to negotiate them. I think you can get pretty far with playing with someone's attention, but I think what I really need to do is come up with a plan for negotiating the motivation-side of feedback. It can be frustrating to try to improve your performance without clear comparison, and I need to make this side of things work. I'm just beginning this process, but I'm going to need to come up with ways to give my students goals, to give them a chance for revision, and to give comments that give kids clear and actionable ways to improve. A lot of this is fuzzy to me, but I think I have a clearer direction now. Worrying about how good you are at something can be a motivation-killer. How do you give feedback that avoids that, but that doesn't just turn into managing their attention? Are there other mechanisms through which our responses to kids directly impact their learning? When do you want to redirect someone's attention in a productive way, and when do you want to try to motivate them towards some goal? What sort of routines do I need to have to help me systematically improve my feedback-giving habits? I think a lot of your homework questions point to the broader messages we send kids about learning -- and learning math in particular. Classroom routines and signs can do some of this work. For instance, posting the word "YET" prominently in the classroom gives you a consistent response to the self-defeating statements like, "Ugh! I can't do this! I don't know my times tables!" You smile and point to the YET and read it to the student as the end of his sentence. 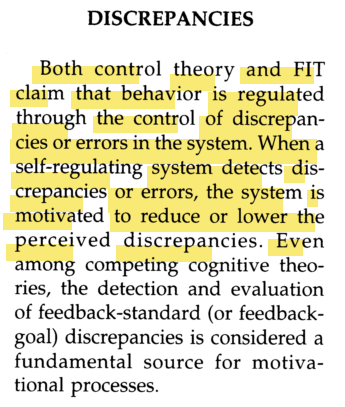 Similarly, having a figure like the one in my book (sorry for the self-promotion) that shows how confusion is part of the learning process, when a student starts to give up in frustration, you can say, "No! Don't stop now! You are right on the edge of the good part where you really understand." I participate in class discussions. They can rate themselves and you can confer with them on their ratings. Some students really underplay their student skills, while others inflate them. You can be a reality check either way and have them set personal learning goals: choose 1 or 2 things to get better at. Then try to encourage them in that direction and celebrate when they succeed. I can obviously go on about this. Hope it's helpful! I like the student skills idea. I think, though, that I would change the first one to "I persevere when I don't understand something and ask questions if I get stuck." Some students treat confusion as an "I quit and will just sit here until you come over to tell me how to do it" get-out-of-work-free card. They need to be encouraged to keep working through confusion. Thanks for the thoughtful comment. I'm curious to hear more about what "persevering" looks like to you. I think I know what you mean -- that kids keep on trying things, even if they aren't getting far with what they're trying -- and I wonder what it takes for a kid to persevere in that sense. Well, I'm still working on that part, so consider this a rough draft! I ask students to come up with a specific question (not just "I don't understand"); encourage them (some teachers require them and I might start doing this) to talk to teammates before summoning me; have them write down the problem (or key parts of it) before we talk about it; ask them what they think the problem is asking at the start of our conversation. Those are all things students can learn to do before deciding they are stuck and can't proceed further without help, and if they do them, either they will realize they're less stuck than than they thought and/or the conversation can start at a more productive point. I love your "question-crafting" advice. That resonates strongly both with what I see from my students and also in myself. It's always easy to keep working on a project when I have a bunch of questions to work with. 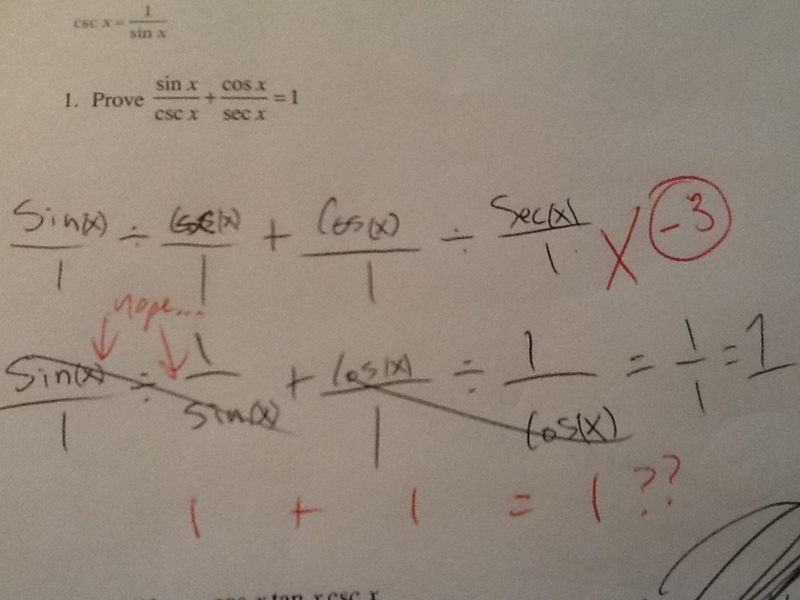 I also wonder whether these strategies need to be adopted to specific areas of math. Do we need to teach kids how to find specific questions that are productive to ask when working on solving equations? With a modeling problem? With a scenario? Finding a question to ask can sometimes be very difficult, I find. But that difficulty probably goes hand-in-hand with its usefulness for persevering! But actually I think part of the magic is that defining almost ANY question will help get them hooked. If you answer to "I don't understand," it's like you're agreeing that they can't even start. Once they define a particular question, they're now owning the problem in some tiny way. They've begun the process of solving it, and are now at least a little bit invested in continuing. I love your joke example: "I discover that my joke didn't make anybody laugh, so I'm motivated to try and tell a funnier joke." Before giving up to find another joke, my feedback to you would be: "Your joke is missing exaggeration, and surprise. Develop these two elements and try it again. I'm certain you'll create a terrific punch line." -- I'm giving you formative feedback and I'm letting you know I'm confident in your abilities. In our district we focus A LOT on effort. Acknowledging the effort a student puts forth isn't feedback but it lets the student you know that you see how hard he's working. There are a boatload of other student skills that you could incorporate into a routine. They are not math specific but someone's gotta do them. Organization of binder and class notes, using the assignment notebook, time management, etc. This post includes an example of a progress report where students rate themselves and I discuss their responses. You could also run a workshop model where one station is dedicated to you conferring with students. I'm looking forward to reading more suggestions. I love the idea of giving kids that sort of confidence. I remember in a TMC session that Max Ray said to the crowd, after giving the task, "And I know that you can do this." After he said that I felt myself eased. It was a huge moment, and I'm seeing it again in the feedback you want to give my joke. I think that I disagree, and that praising a kid's effort (which is how I'm reading your "acknowledging") is a sort of feedback. You're judging their effort against an ideal, and letting them know that they're meeting the goal, in an attempt to motivate them to stick with it. At least, that's one way that you might see what's going on there. Do you have a different take on those sorts of interactions? That workshop structure sounds interesting, I usually just run around class like a pinball. Ignoring The Meaning of "Feedback"